Corals are under a lot stress these days—from pollution, overfishing, sea level rise, warmer seawater temperatures, and the increasing acidity of the oceans. Among these stressors, the impact of ocean acidification is often the most insidious and difficult to detect. It threatens coral reefs by making it harder for corals to build their skeletons. But exactly how do corals go about growing their skeletons? 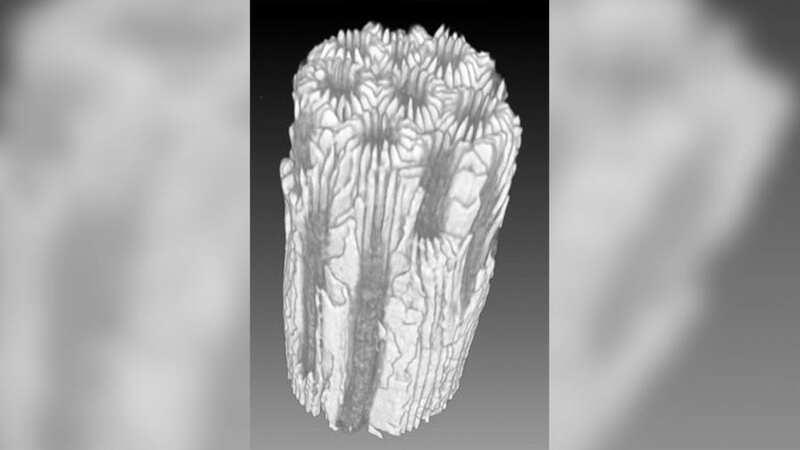 Nathaniel Mollica, a graduate student in MIT-WHOI Joint Program, was part of a team that delved into the details of how coral skeletons are built. 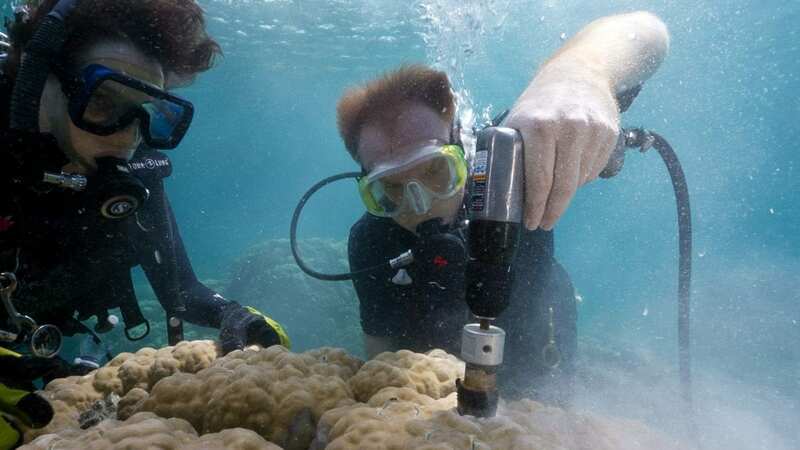 What they found will help scientists predict more precisely how corals throughout the world will fare under ocean acidification. Coral skeletons are made of aragonite, a form of calcium carbonate. To grow up toward sunlight, corals construct a framework of aragonite crystals. At the same time, they buttress this framework with bundles of additional crystals, which thicken and strengthen the skeletons to help them withstand breakage caused by currents, waves, storms, and boring and biting by worms, molluscs, and parrotfish. Ocean acidification is caused by rising levels of carbon dioxide in the atmosphere, mostly from burning fossil fuels. The carbon dioxide (CO2) is absorbed by seawater (H2O), setting in motion chemical reactions that produce more bicarbonate (HCO3–) and fewer carbonate (CO32-) ions. Coral polyps—the tiny living soft-bodied coral animals—bring in seawater containing these ions, along with calcium (Ca2+) ions, into a “calcifying space” between its cells and the surface of their existing skeletons. They pump hydrogen ions (H+) out of this space to produce more carbonate ions (CO32-) ions that bond with (Ca2+) ions to make calcium carbonate (CaCO3) for their skeletons. Because there are more HCO3– ions but fewer CO32- ions in acidified seawater, the corals have to expend more energy to pump out H+ ions from their calcifying space to build skeletons. Laboratory experiments and field studies, however, have shown that acidification affects skeletal growth in some cases, but not in others. To explore this ambiguity, a research team led by Woods Hole Oceanographic Institution scientists Weifu Guo, Anne Cohen, and Mollica dove into the problem. Literally. Something Mollica had never envisioned he would be doing in his career. His favorite subject was geology, which led him to apply to the Colorado School of Mines. The school was primed to train students to go into applied fields in the oil and gas industry or civil engineering. Those didn’t interest Mollica, so he took a year off, taught math at a refugee school in Denver, and looked at options for graduate school. His particular interest was in the formation process of carbonate rocks, and his grad school explorations led to Cohen, a scientist in WHOI’s Geology and Geophysics Department. Cohen informed him that her lab didn’t do research on carbonates in a geological sense but on the primary architect of carbonate systems: corals. More specifically, the lab focused on how corals are affected by their environment, and how that, in turn, affects their ability to produce carbonate skeleton. Among the first things Mollica had to do when he arrived at WHOI was take a month-long course to learn how to scuba dive for his research. 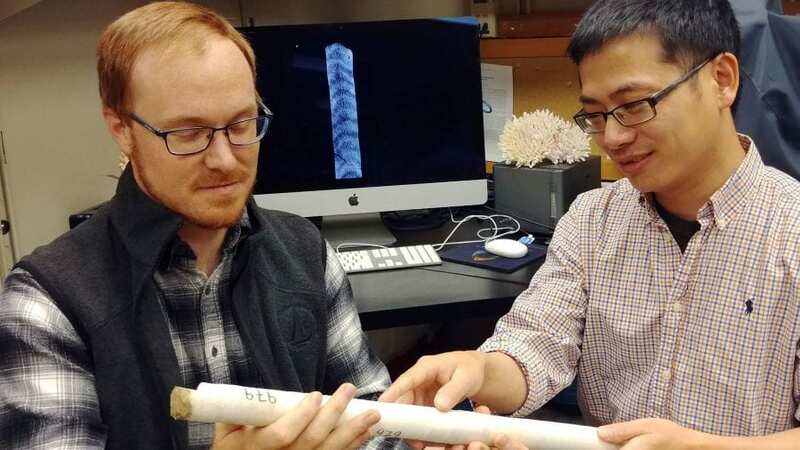 He and colleagues dove on reefs and used a drill to extract tubular, 3.5-centimeter-diameter cores from coral skeletons in four locations in the Pacific Ocean, where seawater conditions spanned a wide range of pH levels and carbonate ion concentrations. 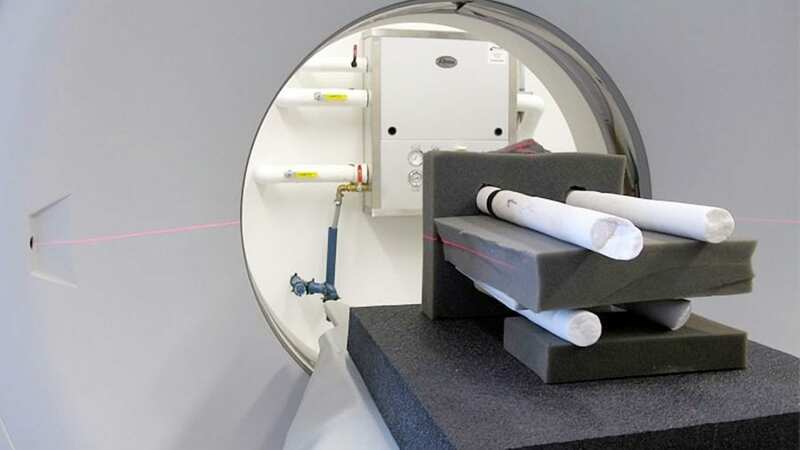 The researcher team, which also included Cohen and WHOI scientist Weifu Guo, used a 3-D Computerized Tomography (CT) scanner to image the skeletal cores, which reveal annual growth bands, much like rings on a tree. From the scans, they could discern the upward and thickening components of the coral growth. Their analyses revealed that skeletons of corals in more acidic (lower pH and fewer carbonate ions) waters were significantly thinner. But they found no correlation between upward growth and carbonate ion concentration. 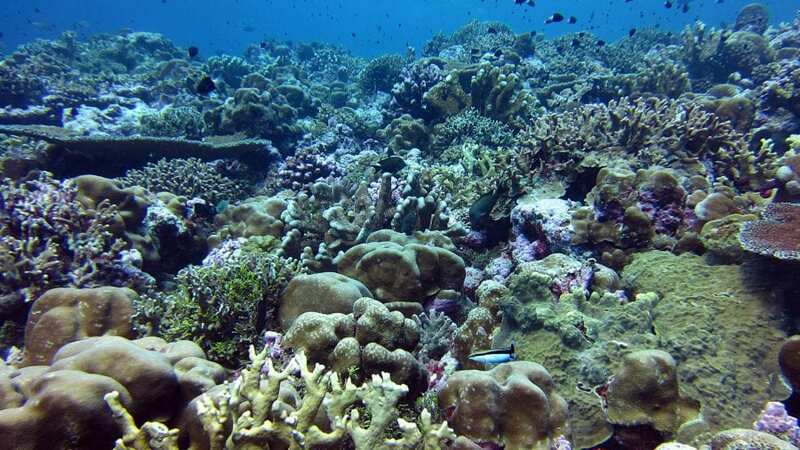 The researchers examined the coral growth process more closely. They determined that declining pH and carbonate ions in seawater strongly affected the corals’ ability to produce the aragonite bundles it uses to thicken their skeletons. In acidified conditions, corals continue to invest in upward growth, but “densification” or thickening suffers. 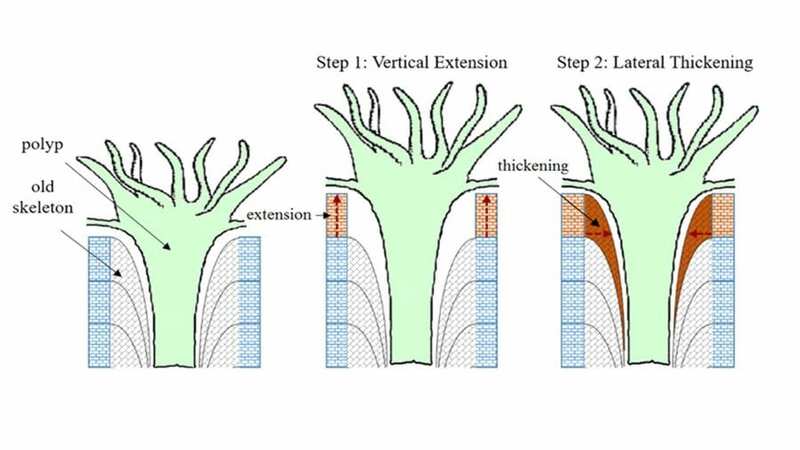 As a result, the less-dense skeletons of corals in lower pH waters are more susceptible to damage from pounding waves or attacks by eroding organisms. Finally, Mollica and the research team developed a model simulating this new-found detailed skeletal growth mechanism and coupled it with projected changes in ocean pH around the world. They published their results in January 2018, in the journal Proceedings of the National Academy of Sciences. The research team included Nathan Mollica, Weifu Guo, Anne Cohen, and Andrew Solow (WHOI), Kuo-Fang Huang (Academia Sinica in Taiwan), and Hannah Donald and Gavin Foster (University of Southampton in England). The research was funded by the National Science Foundation, The Robertson Foundation, the WHOI Ocean Life Institute, and the WHOI Investment in Science Fund. Coral polyps—the tiny living soft-bodied coral animals—grow up toward sunlight by constructing a framework of aragonite crystals. At the same time, they buttress this framework with bundles of additional crystals, which thicken and strengthen the skeletons to help them withstand breakage caused by currents, waves, storms, and boring and biting by worms, molluscs, and parrotfish.